Arne Jacobsen designed and created St Catherine’s College – inside and out. From buildings, lighting and cutlery to his now world-renowned chairs and beautiful gardens, Jacobsen’s designs create the look, feel and atmosphere of our extraordinary college. Jacobsen’s designs mastered the most personal and successful interpretation of international functionalism. His architecture includes a considerable number of epoch-making buildings in Denmark, Germany and in Great Britain. 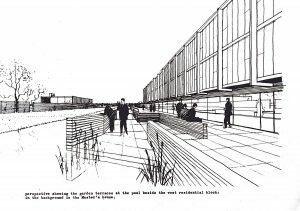 As is demonstrated clearly within the College, Jacobsen was interested in the idea of ‘total-design’, designing both furniture and fittings for the majority of his projects. He depended on attention to detail, appropriateness of material and the melding of traditional techniques in order to generate concept and form. Jacobsen introduced modern architecture to Denmark. In doing so, he strengthened an internationalist aesthetic but, through his sensitive efforts to meld modern functionalism with Danish traditionalism, he helped create a modern style that is both Danish and contemporary. St Catherine’s, his modernist masterpiece, was to become the most important 20th-century collegiate building in Oxford and opened its doors in 1962 (whilst still under construction!). The College remains one of the UK’s few post-war grade 1 listed buildings and its gardens, largely still to Jacobsen’s original plan, are noted by English Heritage. Jacobsen considered the gardens as an integral part of his design, with a variety of green spaces visible from inside most of the main rooms and communal areas, bringing the outside inside and adding to the overall tranquil feeling of the site.